Gregg College Keyboarding and Document Processing (GDP), Word 2010 Update, 11e by Ober, Johnson, and Zimmerly provides a highly flexible, complete learning system designed to process and score documents created in Word 2010. As a solid product for over 30 years, this version of GDP has evolved to a completely online version, along with updating the program to be compatible with the new Microsoft Word 2010 software. Strong enhancements and flexible Instructor Management still exist and support the program's strong content. Instructors will appreciate the flexibility of Instructor Management that can be successfully implemented in a variety of classroom environments and that can be accessed from any Internet-connected computer-with no downloads! "I started at 55 words per minute, and after this class I'm up to almost 70. Not much effort required, but 10-key leaves a little bit to be desired." 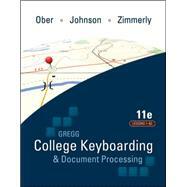 Gregg College Keyboarding & Document Processing (GDP); Lessons 1-60 text: 4 out of 5 stars based on 1 user reviews.